I love that time when you are just about to fall asleep. That moment in between awake and asleep. It's such an creative space. For example, last night at that very moment, I just knew that I had to, that I really really must, add a wood grain to the background of this ole drawing. Why? Who can say. I could analyse it, but I think it's best not to. And, what can I say about my last post? Just that I am completely blown away by the response. I'm still speechless (not that you'd notice), and will be sure to keep you posted on the building of the AJ empire. Thank you, all, so very much. 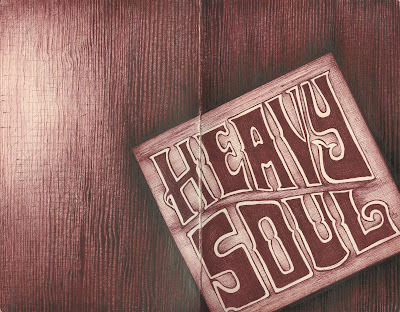 One more thing, you can now follow A Heavy Soul on Twitter. That's me by the way. Andrea Joseph was already taken. The swines! BRILLIANT . . . perfection!! I have just had my nose almost pressed to the screen here as I couldn't believe you had drawn the wooden background! You have an outstanding talent. I wouldn't worry too much about your website getting stale, according to directory.sootle.com/website-worth, your website is worth $295,481. Now, I'm not sure how to actually get that money, but it has to make you feel good! I'm repeating myself now but you are in a class of your own. PS I sent you an E-mail a while ago about sending you a drawing, did you get? It's tough when you can't even give it away. i wood love to see this in person! amazing, once again! i was afraid to leave a comment on your last post with the undies... here's to your empire! That is so cool! That wood grain is spot-on! Also love the lighter patch on the left - it looks like a spot light is shining onto the table. Hi Andrea-I'm not on Twitter, but I jut looked at your Twitter link, and saw your post about Found Magazine. I first heard of them a few years ago on NPR (radio) here in Chicago. I don't know if you've ever heard of the program "This American Life," but my husband and I saw it live, and Davy Rothbart of Found read some of the found stuff out loud and he was fantastic. We then saw him a few other times live, whenever he was in the Chicago area. If you ever get the chance to see them live, they are hilarious. His little brother Peter Rothbart is a great singer/songwriter who has written some songs based on things submitted to Found. His band (or maybe it's just him?) is The Poem Adept, and I bought their CD at one of the Found appearances. WONDERFUL! Anyhow, this was a lengthy comment, but any fan of Found is a friend of mine! This is one of my own personal favourites. I quite liked it before I put the woodgrain in, but back then I knew it had the potential to be a drawing that I really liked. Not just quite liked. Raena, thanks for that link. It seems to have shot up another $500,000 since. Definately makes me feel good. Would make me feel even better, right now, if I could get my hands on that kinda cash! Stephen, CANNOT WAIT!!! Thank you. Joseph, you can comment on my undies anytime you like! Becky, thanks for all the info. I've Googled the lot of them. I'd love to see that show. I'd never even heard of Found until a couple of days ago and I've been addicted since. Your soul is heavy because you have a secret about a drawing. You are selling printable versions of that converse shoes drawing. But can you show me a picture of the original one? In your other drawings why are you searching for words?